Herbal Fiberblend? provides the initial detoxification you need to start down the road to and maintain whole body health. Its combination of fiber and cleansing herbs also provides the perfect way to keep your digestive system clean and maintain your digestive health. Two tablespoons (16 g) of Herbal Fiberblend?contain 9 to 10 grams of fiber-most nutritionists recommend 25 to 40 grams of fiber a day. Psyllium, which is the main fiber source in Herbal Fiberblend?, has over eight times the bulking power of oat bran. Psyllium is approximately 75 to 80 percent dietary fiber, 60 to 70 percent of which is soluble fiber. The herbs in Herbal Fiberblend? bring you powerful detoxification effects. Combined, these herbs make Herbal Fiberblend? one of the most valuable fiber and herb products available today. Herbal Fiberblend? is a professional formulation of herbs in a convenient, easy-to-use powder. No grinding and mixing herbs yourself! It is available in raspberry flavor and unflavored. How to use Herbal Fiberblend? Children should start out with ? teaspoon (1? g) per day and gradually increase to 1 teaspoon (2.5 g) per day. Use for 3 months for initial program, then as desired. Add Herbal Fiberblend? to 6 to 8 ounces (180 to 240 ml) of water or juice. Remember that the more fiber you consume, the more water you should consume. Drink 8 glasses of water per day while using Herbal Fiberblend?. Take Herbal Fiberblend?1 hour before or 30 minutes after taking BarleyLife?, Just Carrots?, or AIM RediBeets?. Click to learn about whole body health. A few people, notably healthcare providers who have been occupationally exposed to psyllium dust, may develop a sensitivity to psyllium, resulting in an allergic reaction. Some of the herbs in Herbal Fiberblend?, if taken in large quantities, might not be safe for pregnant or nursing women. Although none of the herbs in Herbal Fiberblend? is found in a large quantity, if you are pregnant or nursing you should consult a health practitioner. If you are having more than 3 eliminations per day, you should reduce the serving size. How much to reduce the serving size depends on your weight. This may occur because of differences in metabolism. Herbal Fiberblend? has a shelf life of 3 years, unopened. Close tightly after opening and store in a cool, dry, dark place (70-75 ?F; 20.1-23.8 ?C). Do not refrigerate. New Complimentary fiber product. Great for maintaining and for enhancing Herbal Fiberlbned. AIM Fit'n Fiber. Click here for more details - pdf datasheet. How does Herbal Fiberblend? help whole body health? 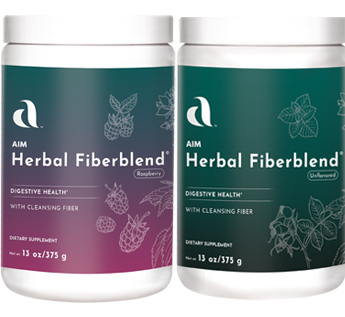 AIM Herbal Fiberblend? provides you with fiber and cleansing herbs. This combination helps you rid your body of toxins. A clean, toxin-free body is the first step to maintaining overall health. 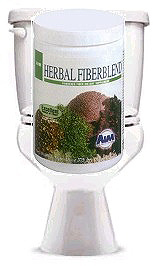 How much fiber is in Herbal Fiberblend?? A two-tablespoon serving contains approximately 10 grams of fiber. The recommended daily value is 25 grams, and many nutritionists recommend up to 40 grams of fiber per day. Will the fiber in Herbal Fiberblend? result in mineral deficiencies or remove "good bacteria?" Although research continues on this question, studies indicate that psyllium fiber will not result in mineral loss, and friendly bacteria actually feed on fiber. What can I expect when I take Herbal Fiberblend?? You may notice more regular bowel movements and more complete evacuation of waste. As the fiber and herbs "clean" your system, you may notice common detoxification symptoms, such as rashes or feeling tired. See the Detoxification data sheet for more information. Can Herbal Fiberblend? be habit-forming? No. None of the constituents of Herbal Fiberblend? is habit-forming. However, if you stop taking it, you will need to replace the fiber by eating more natural fibers because your body will have grown accustomed to the amount of bulking fiber in Herbal Fiberblend?. If you do not replace it, you may experience some constipation or irregularity as your body adjusts. Herbal Fiberblend? is a Whole Body Health product. The complete Whole Body Health lines consists of the Garden Trio? -- BarleyLife! Barleygreen?, Just Carrots?, RediBeets? -- and Herbal Fiberblend?. Use these products to give yourself a solid foundation for your health. Herbal Fiberblend  and BarleyLife  are recommended world wide. Jensen, Bernard. Dr. Jensen's Guide to Better Bowel Care. Garden City Park, NY: Avery Publishing Group, 1999. Schumacher, Teresa, and Toni Schumacher Lund. Cleansing the Body and the Colon for a Happier and Healthier You. St. George, UT. 1987.